In our workshops and classes we shoot tethered a lot. One question that always comes up is about cable length: Participants go home, buy themselves a cable, plug it in and…. things don’t work out. Or worse: Transfer speeds are slow to a crawl and you start blaming the camera, laptop or software. Problem is, when moving around the set, you need a long cable between your camera and laptop to allow for proper range of motion and to not constantly yank the cable out of your camera! The USB standard states, however a maximum cable length of 16.4ft/5.0m for USB 2.0 (9.8ft/3.0m for USB 1.1, but really, don’t even bother tethering over the slow version) and “suggests” a 9.8ft/3.0m maximum length for USB 3.0. This is far from sufficient, 10m has been found the absolute minimum that makes sense for shooting in our studio. There is, however, one workaround: The use of so called “repeater” extension cables. These cables have a small booster at the end, which reads and re-sends the signal instead of just passing it along. They can be strung along in a row, and so long as there is never more than 15 feet of cable between boosters, it is possible to run USB up to an extended maximum of 80 feet. Be careful with overly cheap cables found on EBay, etc. Make sure to read the reviews first to see if other people have had problems with them. Especially for tethered shooting, it is worth to pay the couple extra bucks to get a high quality cable and save yourself the hassle of degarded trasfer speed and data errors. We have found the sweet spot to be around $15-$20 for a 10m cable. 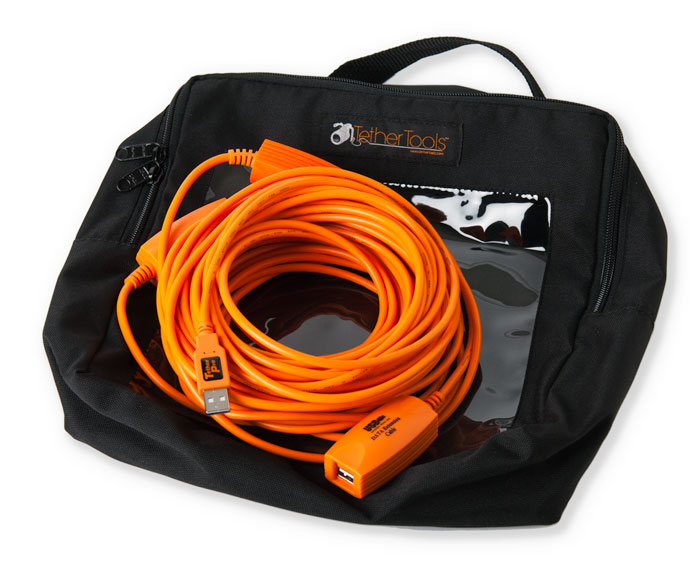 Anything below has been a lottetry so far, with cables in the same shipment behaving differently when used in thr same environment… Companies like Tethertools provide quality cables in high visibility orange, which is very useful and hard to find anywhere else, but at a significantly higher price. If anyone can suggest a good, reliable source for low cost and hig hquality repeater cabels, please let us know!